Even though the party had been delayed by Agatehead's antics, they made relatively good time. The day was overcast and a bit muggy, it felt like rain was on the way. And even though the terrain was "open", it was far from being a flat pasture. There were lots of gentle "ups and downs" and quite a lot of cover -- brush and trees and far too many rocks for comfortable walking. Fortunately, some two hours north of Abelard's Tower they spooked a deer. With a lucky bowshot, Jack downed it just as it was cresting a knoll. Despite their meager supplies, now they'd have venison for their supper. They had just finished skinning and cutting up the deer when a bright flash of lightening pulled their attention to the south. Even before the thunder reached them, they saw a second bolt of lightning hit Abelard's Tower. Then a third and fourth; and more and more the bolts poured down -- all striking the tower. "That's not natural" said Yobella. "It's almost as if someone or something is targeting Abelard. But why?" Zilwen answered, "I fear it isn't Abelard that's being targeted. I fear my family's enemies have learned that I was there." "Whether those bolts are targeted or not, I suggest that we get off of this knoll and under cover." interjected Glenrick. "It's about to pour -- I have Elven blood, I know." So the party moved off of the hill toward a wooded valley to the east (in part to get out of the rain that did indeed pour down). Once under cover, Zilwen said that he'd release them from their promise to help him get home. That Abelard was probably dead and that they didn't owe him anything any more. Nikos responded that as far as he was concerned, his honor bade him keep his word. One by one the others agreed. "However," offered Nikos, "as much as I'd like a day in town, I don't think it would be wise to be seen anywhere near here soon. If there is someone hunting Zilwen, it would be best not to be seen. Which means travelling through the Dark Woods." And so it was decided. Even Zilwen, who had a great aversion to entering the Dark Woods, finally agreed. 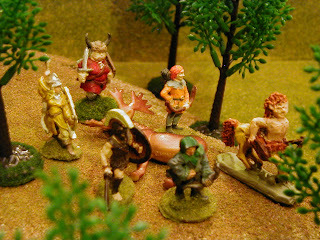 So the party followed their wooded valley east into the dank, dark wood . . . I had certainly expected a different scene. Perhaps even reaching Garthian and interacting with its denizens . . . but it was not to be. I must confess that some of the ideas given me by folks making comments here and on the Mythic Role Playing Group on Yahoo! have inspired me with both ideas and approaches. My thanks to you all. Please keep the comments coming. By the way, could you provide a map detailing where the PCs are in every post? This way we could easily see how the strory (the travel) is evolving. I don't have any useful advice at this point. Just enjoying watching the adventure unfold and gathering inspiration for an eventual Mythic adventure myself. Still enjoying the minis illustrations. I hope you keep them! And finally a wondering about your double rolls : you clearly take them as signifying "random event", as I read it from the book, but you also pick the odd/even number to mean Altered Scene or Interrupt Scene. Is this from the book or a personal preference? I do plan on having maps more often, but so far they are less than a day's journey from their starting position. Keep the comments coming . . . that way I know that someone is still reading these. I'm glad that you like the "photo scenes" with miniatures . . . that is one of the reasons why I'm running this as a blog and not just posting to the Mythic group. As for the doubles, it has just happened that I've rolle two . . . and both were "Altered Scenes" (33 and 11) . . . and immediate ideas came to mind. But I've not really thought about it. This is my absolutely first try using Mythic and I'm still feeling my way. Oh I understand, it's just that I remember (and thus might be very wrong) that random events on doubles weren't specified as Altered Scenes (that would be for the d10 roll at the start of a scene if I recall correctly). You're right, I think that maybe I am. The two doubles were not before the scenes, but in them.